to be shared “live” on Talk to Me Tuesday! The following is the August 2014 block (Block 8 for us) made for my 1930’s vintage fabric-inspired version of this quilt (above). Today’s pattern, Block 8 (August 2014), is Caught in the Web. 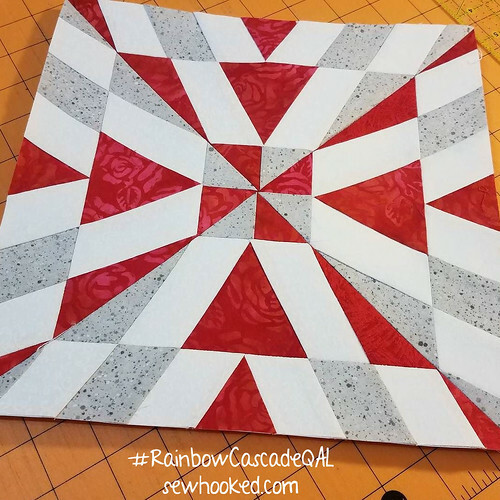 You can find it beginning on page 37 in Paper Piecing Vintage, or you can purchase JUST this block pattern here. I was lucky enough to have just enough of this fantastic orange spider print to make this block. The stripes were fussy cut to add a little more movement. I ♥ it! Eight blocks in…we’re getting closer to the end! Now is a great time to start cutting out those piano keys and 6″ blocks for cornerstones (optional, of course!). I’ll see you tomorrow for Talk to Me Tuesday when I’ll be choosing the winner of the 3rd Annual Fat Quarter Lotto!